Cloisonné enamel vase decorated in silver <i>yusen</i> (with wire) and <i>shosen</i> (few wires) enamel. The copper body has an applied silver rim and base plate with the jungin mark. 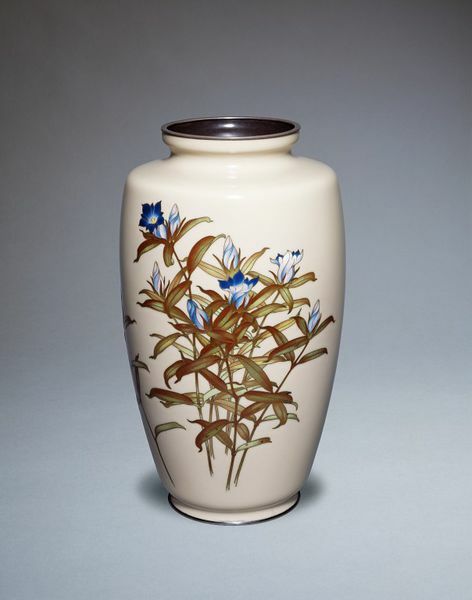 The soft beige-coloured ground is decorated with gentiana (rindo in Japanese) in silver yusen and shosen enamels with areas of the petals and some of the leaves in low relief moriage. There is elegant shading to the blue and pink of the petals and similar shading to the browns and greens of the leaves and stems. The counter-enamel is of two shades: an overall dull green with dark brown visible just inside the neck. The latter enamel has also been used on the inner base, where the silver yusen mark of the Ando Company has been applied. For another illustration of this vase see Fairley, Japanese Enamels of the Meiji Era, no.55. Cloisonné enamel vase decorated with gentiana flowers bearing the mark of the Ando Company. The vase has a copper body with an applied silver rim and base-plate with a jungin (pure silver) mark. Cloisonné enamel vase decorated in silver yusen (with wire) and shosen (few wires) enamel. 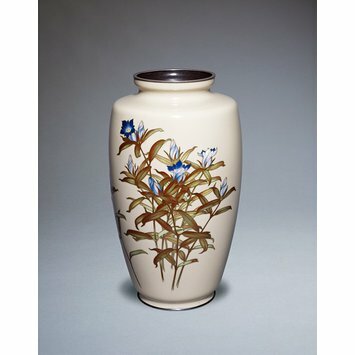 Cloisonné enamel vase decorated with gentiana flowers, the mark of the Ando Company, Nagoya, Japan, c.1930-50. Irvine, Gregory. Japanese Cloisonné. (London:V&A Publications, 2006), p. 116. Irvine, Gregory. Japanese Cloisonné Enamels. (London: V&A Publishing, 2011). pl. 73.